The term diaspora refers to the movement of any group from its traditional homeland. One of the largest diasporas in history was the African Diaspora, much of which took place as a result of the Transatlantic slave trade that began at the start of the 16th century. Slaves were first brought to Bermuda in 1616. Most were blacks from Africa, although some were American Indians. In 1834 slavery was formerly abolished in Bermuda. Slaves were given the same rights as other Bermudians but not the right to vote. The African Diaspora Heritage Trail is a self-guided tour established by the late David Allen, a former Minister of Tourism. National Museum of Bermuda, Royal Naval Dockyard – 2-room slavery exhibition in Commissioner’s House featuring artefacts and displays relating to slave life in Bermuda and the Transatlantic slave trade. Cobbs Hill Methodist Church, Warwick Parish – Completed in 1827 by the free blacks and slaves of Warwick Parish. Situated on Moonlight Lane, so named because the church was built mainly at night. Barr’s Bay Park, Hamilton – In 1835 the Enterprise, an American ship carrying slaves from Virginia to South Carolina, was forced by bad weather to dock at Barr’s Bay Park. Slavery had been abolished on the island in 1834 and the slaves were offered the chance to continue to Charleston to be sold or live a life of freedom in Bermuda. All but one woman and her 5 children chose to remain. Jeffrey’s Cave, Spittal Pond Nature Reserve – Named after a slave who escaped from his owner and hid here. St Peter’s Church, St George – Features a separate graveyard and gallery for slaves. 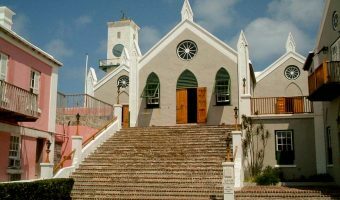 Bermudian Heritage Museum, St George – Bermuda’s only black history museum. Tucker House Museum, St George – Features an exhibition about Joseph Hayne Rainey, the first black elected to the US House of Representatives. Pilot Darrell’s Square, St George – Square named after naval pilot James Darrell, the first black Bermudian to purchase a house on the island. All sites are marked by bronze plaques, handcrafted by Bermudian sculptor Carlos Dowling. The African Diaspora Heritage Trail is a designated UNESCO Slave Route Project. I was looking at my Bermuda handy reference map and noticed another site that is not listed above. The sit is at the corner of Middle Rd. and Khyber Pass in Warwick. The site, according to the map, is the former Slave Graveyard and Memorial at the Rubber Tree. Is this site marked with a bronze plaque? Pleasant park overlooking Hamilton Harbour. Site of one of the most significant events in the island’s history. The island’s largest nature reserve and best birdwatching venue.